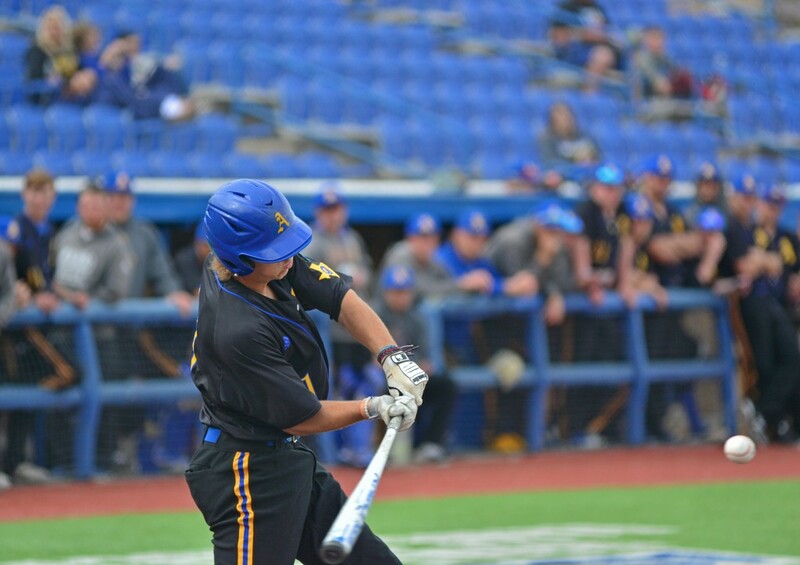 Photo by Ian Saint: ASU hit a massive home opener win defeating the Ore Diggers 14-1. Two out of the park hits furthered their dominance over Colorado School of Mines. The Rams baseball team opened the season with a series against Colorado School of Mines Feb. 1 through Feb. 3, splitting the four games with the Orediggers. ASU won the first game 14-1. The players hit 10-21 for a .476 average. Junior Michael Urquidi brought in two runs for the Rams during the game, while redshirt freshman Jordan Williams finished the game two for three with an RBI. Senior Machian Mayo went two for three with a double and had a run of his own. Jackson Hardy played his first college game and hit for a double. Junior Josh Elvir went three for three with five RBIs, with a double and two home runs. Senior Brandon Dusenberry pitched six strikeouts only walking one batter. On Saturday’s doubleheader, the Rams lost the first game 4-5 and won the second game 13-12, which put the Rams up 2-1. ASU played the last game on Sunday February 3 and lost 12-15, which tied the series. The Rams were down in the fourth inning 6-0. Junior Nicholas Novak came up to bat and got a two-run home run. Elvir brought in two more homeruns for his team, as well. Senior Jacob Finke was brought in for a run after a hit from Mayo, which brought the score 6-5. The Rams brought in four more runs in the next inning coming from Jackson Hardy, Riley Peterson, Riley Peterson, Jordan Williams and Nick Seginowich. ASU started the seventh inning on top, 12-10. The Orediggers came out in the seventh and eighth innings to score five more runs to finish the game. Elvir finished the game 3-4 with four RBIs, a home run, one walk and three runs scored. During the four games, there was a total of 17 home runs scored. The Rams will return to Foster Field on Feb. 12, 15, 16 and 17 to face St. Mary’s University and Lubbock Christian University.